You know, I think it DOES matter what the president eats. Imagine, for a moment, how much leadership he could provide – just by what he eats. Imagine the week of dinners he could choose, if he were inviting, authentic, adventurous, a role model, a proper host, humble, inspirational, a leader. Tonight I’m having a supper club dinner with a group of immigrants who have invited me to try their traditional dishes. I can’t wait to welcome these families who are new to our country and to taste new foods! Meatless Monday! Scott Pruitt and I have decided to set a good example and go meatless one day a week. Eating less meat has a significant impact on reducing greenhouse gases that contribute to global warming. Working late. Exhausted. I know I’m in a food rut, but the meatloaf here is wonderful. I wouldn’t want to force it on you, but I highly recommend it. Comfort food at its best. Reminds me of my mom. Dinner with Ivanka. She’s been on me to lose some weight and eat more healthy. Damn it’s hard. All those dinners out! But, I need to eat more healthy for my kids and my grandkids, not to mention my country! I don’t want to die of a heart attack. Ivanka tells me the Mediterranean diet is healthiest and the Sardinians live to be 100. I’m going to have some grilled fish with a little pasta and vegetables. No dessert! Sugar is evil. But I am going to have one glass of red wine and an espresso so I can send some late night tweets. I’m having a bi-partisan dinner for all the new members of congress from both sides. You know, reaching across the aisle so we can get some legislation passed! I’ve been trying out new chefs for the White House. Tonight’s chef will be preparing an all-American meal made with all-American ingredients from our all-American farmers. American food is great! New restaurant night! I like to try new restaurants instead of the same old same old. There are so many wonderful restaurants with creative and adventurous menus. I find it inspiring to try something new at least once a week. Plus, I get to support small businesses and help create jobs. Ah, happy to be in Mar-A-Lago, my favorite retreat. I am so lucky and grateful to be able to travel back and forth every weekend and catch up with Melania. A long-distance relationship can be tough! We’ll have dinner here and I’ll have the well-done steak smothered with ketchup. I know it’s not the healthiest nor the most gourmet, but it’s my favorite. I’ve cut way back – haven’t we all? My dad and I used to eat steak together and this is how we ate it. Thanks Dad for giving me my start. Imagine! What leadership he could provide, just by what he eats. Actually, I haven’t liked bacon for a long time. I have fond memories of liking the smell of bacon and I feel like I should like bacon but I don’t. We use to have bacon for special occasion breakfasts until I realized that I hated the grease cleanup and didn’t really enjoy the taste, so I stopped initiating them. Sometimes my family acts a bit wistful for these breakfasts, but not convincingly. When out to celebrate my daughter’s birthday at one of our special occasion restaurants, I decided to splurge and ordered the roast chicken with apple wood smoked bacon. When it arrived, the chicken was overcooked and dry. Highly unusual. Just as unusual, I sent it back. They brought me another and it was just a touch less dry. The smokey smell of the bacon was overpowering. I could not enjoy it. Maybe, maybe it was time. I’ve been very gradually eating less and less meat for several years now. Not quite putting a stake in the ground. Rather, I’ve been tip-toeing toward pragmatic vegetarianism. Eating less meat as long as it didn’t disturb anyone else’s meal plan. As is my cautious way, afraid to put myself whole heartedly out there with a strong point of view. I can argue both sides, affiliating with everyone while offending no one, and not really honoring who I am. After all, I love a juicy roast chicken or a grilled steak or my husband’s homemade meatballs. And while trying to feed a family of four with completely different food likes and dislikes, why add another challenging component to getting dinner on the table? Declaring myself a vegetarian seems both selfish and an act of self-sabotage. It’s hard enough to deal with dinner for the family every night of the week. Do I really need another food rule to live by? When I took the step of getting more serious about yoga, I became aware of one of the first principles of yoga, Ahimsa, which translates to nonviolence. Many yogi’s are vegetarian and base their decision on this precept, to be kind to all living creatures. That year I reflected on the ways I inflict harm on myself with my cuticle picking and anxious thoughts. I started looking people in the eye and smiling more. I noticed that I felt better and slept better when I ate less meat and so my gradual tapering off of meat began. I found meatless recipes that made it into the family dinner repertoire. I brown-bagged my lunch and ate out less frequently or at restaurants that had more vegetarian options. I lost 15 pounds. But I didn’t really question the values behind the food chain. Why shouldn’t we eat meat? It’s what we humans do. When we went away for vacation last month, I found myself ridiculously sad to leave our two parakeets behind. We got our first parakeet, Cooper, for Christmas two years ago to satisfy my son’s desire for a dog. 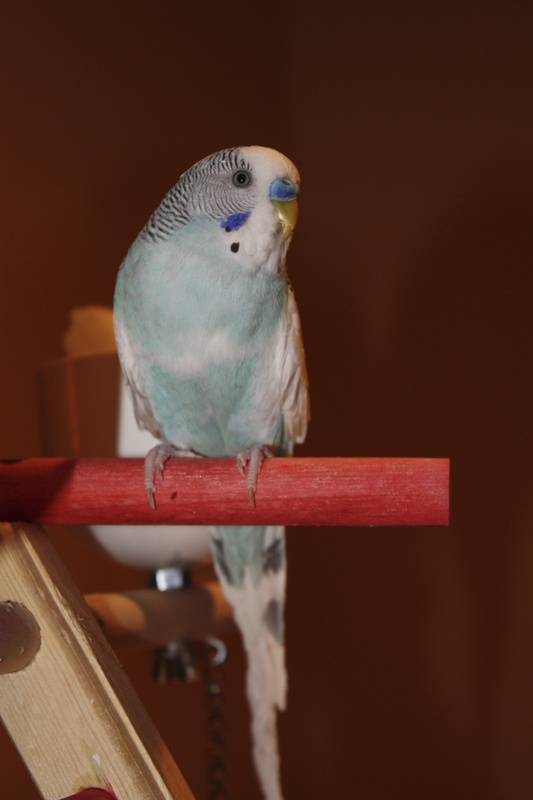 We felt our lifestyle was not amenable to having a dog and settled on a parakeet instead. Cooper is attentive, social, sweet and adapted quickly to the family, hanging out with us as much as we let him. We were still away for much of the day, however, and we worried that he was alone and lonely. So Ginger joined the family a year later. She has not acclimated as well, presumably because she has Cooper in a way that he didn’t have another bird to fall back on. She is more wary and less friendly, with a very distinct personality to whom I’ve also grown very attached, identifying with her wariness. I grew up with pets. As an only child, I would fantasize about how wonderful it would be to have a companion and wheedle until my parents would give in. Fish, a turtle, gerbils. Then there were the more significant and long-lived pets: George the guinea-pig who would oink excitedly when he heard the refrigerator door open, hopeful that some lettuce was coming his way. Buddy the parakeet for whom I played a recording of me saying “Hi Buddy!” for hours, hopeful that he would someday say “Hi Buddy!” back. He never did. And Pansy the poodle, who became my mother’s dog, not mine, because she was the one who fed her and spent time with her. When George and Buddy died, I felt enormous guilt. After the initial infatuation, the drudgery of having a pet set in and there was only so much bonding I was able to do with a guinea pig and a parakeet as a young girl. With Cooper, and Ginger, there was some sense of wanting to alleviate my guilt. Could I take better care of them than I did of Buddy? I watched them. I looked them in the eye, trying to understand their moods, imagine what they might be feeling, trying to create a nice life for them, as much as a caged suburban life can be for a wild creature, even if bred for caged suburban life. Why is it okay to eat chicken and not parakeet? Why is it okay to eat pig and not dog? Why is it okay to eat cow and not cat? After looking in Cooper’s eyes and feeling his heartbeat and his complete trust, I don’t think I can eat animals any more. Truly, he has a soul. But what about squishing bugs and eating fish, delicious fish? Where does one draw the line? After reading Cormac McCarthy’s The Road, where the man and the boy are the good people in search of other good people while avoiding being killed and eaten by the marauding gangs of bad people, I wondered, if my life depended on it, what would I do? I am increasingly uncomfortable with considering myself and other humans as better than other animals and entitled to eat them. I am increasingly uncomfortable with keeping quiet about what I believe to be right for me.